LOS ANGELES, CA – Long Beach CA’s sonic superheroes Repeater have launched a campaign with fund-raising site Kickstarter to help press physical copies of their latest album, We Walk from Safety. Both CD and vinyl copies of the album will be available if the goal is met, and the album is already set for digital release on August 2. Repeater goes above and beyond for their fans by offering an array of incentives, such as Repeater merchandise, dinner with the band, private music lessons, private concerts and even the Juno 6 keyboard used on the album. For We Walk from Safety the band teamed up once again with renowned producer Ross Robinson (The Cure, The Klaxons, At-The Drive In). A collaboration in the truest sense, Repeater and Robinson create a unique sonic journey with the combination of haunting vocals, art rock guitars, pounding drums, driving bass and sweeping ambient keys. Each song on We Walk from Safety captures a strange moment in life and time, and reinvents it as a sonic picture. Repeater is comprised of Steve Krolikowski (vocals and bass), Rob Wallace (keyboards), Alex Forsythe (guitar) and Matt Hanief (drums). Their compelling live show has earned them a dedicated fanbase and garnered them notice from the music media. 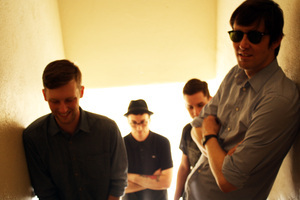 Repeater was voted one of the “best international bands of 2010” (It’s All Indie UK). Repeater’s Kickstarter campaign will continue until August 16th, 2011.